We’re currently running a few campaigns leading to cost per admits around $700 (divide total amount of ad spend for the month by number of admissions to receive your cost per admit or CPA) directly from Facebook campaigns this January. We’ve had campaigns bring in admits for as low as $400. Note that this is much lower than average as multimedia leads in this field tend to be much higher. January is a high demand season for addiction treatment, which helps keep those costs down, but we’ve found Facebook to consistently bring in the cheapest direct response campaign admissions for the past 2 years when compared against Adwords, LinkedIn, call buys from places like Rehabs.com, and other sources. Successful addiction treatment marketing depends on a 3-part strategy – Business Development Support, Inbound through a conversion-optimized website, a little Adwords, and good SEO, as well as Outbound through Facebook, LinkedIn, Email, and SMS. When these three strategies are combined, you get a well-diversified marketing strategy that can whether the ups and downs of this space with multiple channels bringing admissions. Today, I’ll just talk about Facebook as it can be a large driver of admissions. I debated on sharing this info as it’s a part of our secret sauce for admissions generation. But the reality is there is no such thing as plug and play in marketing. We’ve even caught people trying to copy our campaigns ad for ad and still fail. Marketing is a high-level skill set few people possess, especially combining the complex, data driven strategies with the creativity and psychology needed to be effective. Just like an undergrad can’t watch a seasoned clinician and suddenly do what they do the next day, nobody can copy an observed mechanics to get results (though plenty have tried in this space). No one campaign will work for every client. They all have to be individually tailored and tweaked. Additionally, marketing has to strategically fit in with a program’s strengths, market positioning, and the demographics they appeal to. Lots of people think good marketing is about mechanics, but that has little to do with it. Imagine a counselor that had a cheat sheet of notes on how to do effective counseling. Reading and following those notes would not produce positive treatment outcomes. The experience and ability to adapt a large variety of therapeutic approaches to individual client situations in different contexts is essential. Marketing is the same. Experience and skill drive results, not templates. So, for that reason, I’ve decided to share what’s effective. It will help the centers that need the help, and the ones that need to hire out for it will give us a call. Everybody wins. 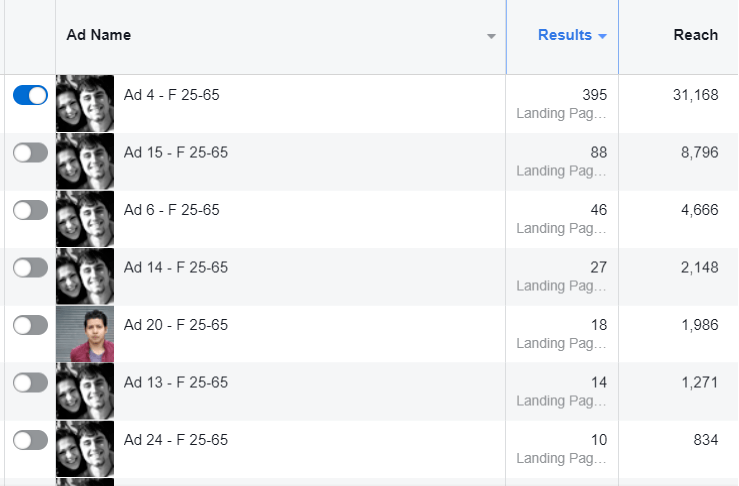 Most centers and agencies have no idea what they’re doing when it comes to Facebook ads. They’re completely different from the usual addiction treatment marketing channels and what you use on Adwords or other places does NOT work on Facebook. If Google SEO and Adwords are like the Yellow Pages of old, Facebook is more akin to Direct Mail or Newspapers, depending on how you use it. The key to successful Facebook campaigns is all in the behavior-based targeting and sequencing. In this post, I’m going to roll back the curtain on what you need to do to make Facebook campaigns successful. Be forewarned. It’s not easy. Managing successful Facebook ad campaigns is much harder than Adwords or even SEO. I’ll do what I can to simplify. If you’ve ever been into the backend of Facebook Ads Manager, you’ll know how overwhelming the wealth of options is. Do you choose a conversion campaign, brand awareness, traffic? Who do you target (there are literally thousands of targeting options that can be layered for millions of potential combinations)? Do you run video, image, carousel, canvas, or call ads? Facebook Ads CANNOT work if you don’t have tracking installed. You must do this before anything else! There is no way to retarget without the pixel installed and retargeting is the only way you’ll find success with Facebook Ads. To double check that your Pixel is installed correctly, add Facebook Pixel Helper to Chrome and double check. That’s just the basic Pixel that goes across the site. You also need to install Standard Event and Custom Conversion tracking for particular pathways such as Contact Us form fills, downloads of lead magnets, and other desirable actions. If you’re familiar with Google Goal Conversions, it’s similar. Also, as a side note, if you’re working with an agency, I recommend using Google Tag Manager to make this easier. Use Pixel Helper to ensure all your Standard Events and Custom Conversions are firing properly as well. With tracking set up, we can jump into campaign creation. Already, we’re presented with a plethora of options. Here’s the reality. It’s ALL ABOUT TESTING. Depending on the client, strategy, audience, and geolocation, all of these types can work at different times. The main thing to understand is that Facebook runs algorithmic, or programmatic, advertising based on your objectives. Let’s say you have an audience of 1 million people and you choose the Traffic objective. This means that Facebook AI will find the people within that audience that are MOST LIKELY to click on your ad. Also, based on data and feedback, it will learn this over time from the data recorded in your pixel. Facebook cannot optimize your campaigns without the pixel installed, which is why it’s so incredibly important to have that done first. Now, the mistake most people make is that they optimize for conversions right away. This won’t work for two reasons 1) You don’t have any data yet. Facebook needs at least 50 conversions a week to optimize for an objective. 2) Long-term sustainability of marketing campaigns is dependent upon the premise that you’re reaching large numbers of people cheaply and moving them along a decision-making process. If you just reach the people ready to convert, your campaigns will be more expensive and you’ll never build the audience you need to drive cheaper cost per admits in the future. Brand Awareness and Reach are usually the cheapest objectives. Brand Awareness optimizes for impressions. Reach makes it so your ad will reach the maximum number of unique people. Both should be used at different times, but, for beginners, Brand Awareness is the smarter choice. Any Objective can only be optimized by the Facebook algorithm if it has 50 conversions a week. If you’re not getting that many, you should optimize for further back in the funnel until you do. You can start with one Objective, and then build a campaign for another Objective as the campaigns progress. You’ll notice that Facebook has laid out the Objectives in an Awareness, Consideration, Conversion journey. It’s a good template to follow. Start with Brand Awareness, move to Engagement, then move to Conversions over time as the data and funnel build out. Video views can be a cheap and powerful way to build a pixeled audience. You can spend a ton of time testing out targeting. Do we target AA members, people in certain zip codes, people with mental health issues, people following Dr. Phil? The options are endless, especially once you start combining them. Build up a persona of your current admissions. Who’s usually driving your admissions: family, friends, self-admits? For example, if my center is mostly young Millennials within a 100-mile radius of my center, I need to go into targeting options and choose “100-mile radius from my location – residents only,” “Parents of 18-26 year olds,” and “Women,” because I want to target their moms. Most Millennials are not making the decision on their own to get into treatment. It’s the parents driving the decision (and usually paying for it). Ideally, you have an audience size of at least 1 million. That’ll drive down your cost per inquiry. So if you don’t have that audience size, perhaps expand out your targeting option. Facebook is an auction system when it comes to cost, like Adwords. So bigger audiences tend to have less competitors driving up costs. Now, here’s the real key. We still need to identify those moms of Millennials within a 100-mile radius of our center who need our help. Most of the population does not have an adult child struggling with substance abuse. One way to do this is to incorporate third-party data analytics. We have a couple data partners that provide us with additional audience segments around “individuals likely to have a substance use disorder” and “individuals likely to have private insurance.” It’s more expensive to layer on that third party data, but it can be worth it if you’re spending less time and money reaching the wrong people. The other way to do it, and part of our secret sauce, is to run content-targeted campaigns combined with Facebook’s behavior-based retargeting options. The key to everything is quality content, and the more connected to your center it is (like real pics, not stock photos) the better. As you can see below in this top of funnel section of the campaign, we’re getting an insanely high 9.27% click through rate. 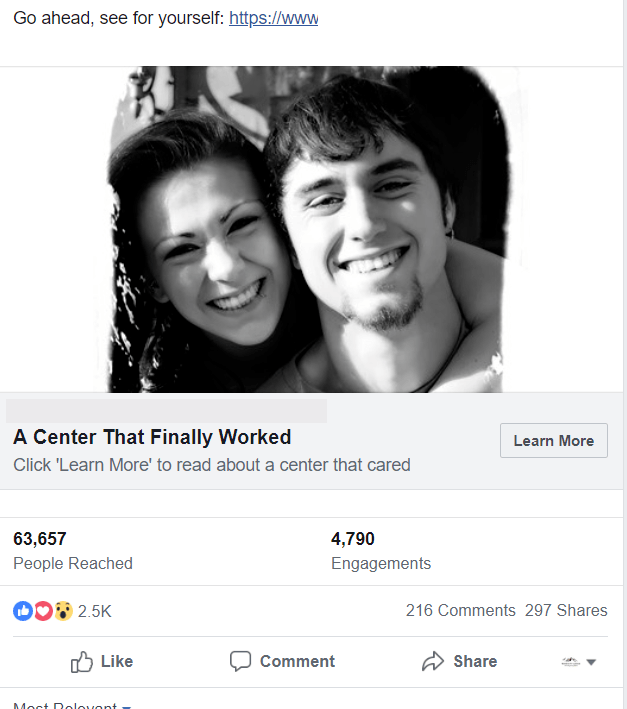 Facebook LOVES good content and so, when you put out good content, they charge you less for it and show it to more people, which is why our cost per click is a mere $.05. For a little over $200, we’ve got over 4,000 people interested in addiction services visiting this center’s website for this campaign last week. To put that all in context, the average click through rate on a top of funnel campaign is 1% with a cost per click of over $1. We get 9 times that for a fraction of the cost. Social proof is also an incredibly important part of this process. An ad might not start out with much traction, but, if you’ve got a well-designed ad, social responses by other people will start to pile on and build trust. If you see an ad with 1 like, you’ll skip past it pretty quickly. But if you see one with 2,600 likes, 216 comments, and 297 shares, you’re going to take a look. Your engagement will snowball bigger and bigger, increasing your CTR. In our ad below, a full 8% of people that see this ad are engaging with it. That’s huge! Imagine the results if you could get 8% of people driving by your center or visiting your website to stop in or give you a call. You’re center would always be full. The other advantage to a great ad is that shares are FREE on Facebook. So all those 267 shares? We don’t pay a dime for. And Facebook can’t track it, but you can be sure some of their friends who see the shared post also shared it, compounding the free reach. That’s the value of viral content. Now a huge mistake everyone makes, and why they don’t ever have successful Facebook ad campaigns, is they stop here. Sure, now this center’s site has a massive traffic boost as you can see from the Google Analytics Screenshot below including before we started Facebook campaigns and after. However, the reality is that, even though we’ve got 2,000 people a day visiting your website for insanely cheap, very few of them are going to call. Why not? Because you haven’t built up any trust. They saw one ad from you for a $20,000 treatment program. Think about it. If you saw a single ad for a new Tesla Model 3 in the newspaper, would you go out and buy it? Of course not! As I always say, there is a direct correlation between the cost of an item and the amount of trust that needs to be built. The higher the cost, the more trust is needed. It’s one reason why it’s much harder to get people into treatment now than two years ago. Two years ago, deductibles were under $500 and centers were paying for plane tickets. Now, deductibles range from $2,000 to $12,000 and paying for plane tickets is illegal. You need to build a hell of a lot more trust than you did in the past to get someone on the phone and decide to drop that kind of money to come into your program. So, if people aren’t calling yet, what do you do? Once those people have raised their hands by clicking on the content or watching the video in the top of funnel ad, we retarget them. We do this through Facebook’s Custom Audience Creation. We can create highly targeted audiences off of almost anything. People who visited your website. People who visited a specific page or pages on your website. This is very important for behavior-based retargeting. People who visit your Home Page are very different from people who visit the Contact Us page for example. Retargeting content must be tailored specifically to where that person is in the decision-making process to work. People who stayed X amount of time on a page. People who engaged with your Facebook Page. People who watched a specific video. People who watched X percent of your video(s). People from a specific group. This is great for targeting Alumni and driving referrals that way. If you want to get low cost admissions, anything under $3,000 per direct response, retargeting is the only way to do it. As I mentioned above, single ad campaigns do not convert to a high enough call volume as you have not built up the requisite level of trust or provided enough valuable content to move the person through a decision-making process. Unlike SEO and Adwords, where the person has already made the decision to get into treatment, and are now just searching for it, Facebook is more like Direct Mail or the Newspaper. People did not go onto Facebook searching for addiction treatment, so you have to grab their attention and then move them through from Awareness to Consideration to Admission. It’s a very targeted emotional and psychological process at the heart of effective Facebook marketing. What does happen is they see a series of ads and it gnaws at them for days. They walk around thinking about their problem. Then, they get to a boiling point and a retargeted ad will push them to call. This often happens in a 7 to 14-day window. But, depending on where they are in the decision-making process, and how acute the problem is, it could take months before they decide to pick up the phone. This is why Facebook creates such sustainable call volume. Once built up, you get people in your 7 and 14-day conversion windows, but then also people at 1-month, 3-month, 6-month, etc, compounding as you go. Like any good marketing, the snowball grows bigger the more consistent you are. You then set up behavior-based sequencing for direct-response inquiries like below. We’ve found that a minimum sequence length of 5 is needed to build up enough trust to drive calls and admissions. Above, you can see the direct online inquiries gathered this month totalling 117. Of course, this only includes inquiries directly from Facebook. It doesn’t include those who direct dialed or Google-searched for reviews, then called from the website. Direct Facebook inquiries, on average, account for only 30-40% of all inquiries generated by a campaign. The majority will be prompted by Facebook campaigns, but contact through another channel. Here’s a good example of what you’ll see happen. For this client in September, they only had 164 site visits the entire month, all of them from Direct channels (meaning they weren’t even being found in Google searches). Fast forward 4 months to January after we’ve been working with them for 3 months. We’re now getting 41,000 visits a month across a much more diverse array of sources. So we’ve got a general working strategy, but how do you get the breakaway results needed for insanely low cost per click and cost per inquiry? The key here is split testing. For an initial campaign with a new client, we’ll literally run over 600 ads to a series of different audiences. We’ll have tons of variations on the images, copy, headlines, and style of ad until we find one that gives us the best results. We’ll also do a number of split tests on audiences to figure out which ones convert best. Any successful Facebook campaign requires massive amounts of data and optimization to succeed. There are two ways to get that data – high spend/short time or low spend/long time. The minimum spend needed to front load is $10,000 a month, but preferably it’s somewhere between $30,000 to $50,000 to enable larger tests. That’s for statewide or national campaigns. Local campaigns can get by with spends under $5,000, but the objectives will be different and based on population sizes around the center. Campaign optimization generally takes around 3 months with this kind of spend. Inquiries and admissions will trickle in at first and then slowly accelerate as we optimize and trust is built up with an audience through sustained campaigns. We can also take a small spend of $2,000-$5,000 a month and do long-term data and audience builds. The results for these campaigns take much longer. Now you’re looking at 6 months to a year from a direct response perspective, although brand equity and lower level conversion campaigns – like newsletter subscribers – can still be achieved in relatively short order, which also leads to inquiry and admissions through standard nurture sequences. While it takes much longer, you’ll usually get enough admissions to at least cover the costs of the marketing spend until you get to a more profitable point with increased admissions six months down the road. Also, very important, note that no campaign can run forever. We switch up and optimize campaigns as needed. Audiences get bored or saturated, the market shifts, or other factors occur that contribute to a drop in results over time. Iterating on campaigns also helps you optimize them. You can see in the last image above that we brought cost per inquiry down from $22.78 to $7.64 over the course of the campaign. You never see McDonald’s or Starbucks running the same ad forever and ever. That’s because it doesn’t work. Creative has to be fresh and relevant in order to convert. You have to constantly monitor your ads to ensure they are working. AND, you need to use all your data to continuously optimize and improve campaigns so that costs drop over time. I mentioned in the beginning that we have campaigns running delivering average cost per admits of $700 this month. That result was achieved after months of work testing, building audiences, and optimizing campaigns. You’d never get that kind of result right away in the first month of a new campaign. Let’s say you do everything right, but you’re still not getting low cost inquiries or admissions. Then you need to troubleshoot. The easiest way is to map out a chart per campaign as in the example below. We want to look at what each step of the decision-making process looks like and see where things are broken. You do this by comparing benchmarks to previous campaigns. Obviously, we have tons of data on how a campaign should be running. If you don’t have that internal data, you’ll need to build it up or hire someone like us who already has it. First we’ll look at the CTR All. If it’s low, then we know we have a problem with our image, headlines, and copy hook. If the CTR All looks good, but we’re not getting any actual traffic to the site, then we know our call to action is weak. If we’re getting site traffic, but no calls, we know the landing page has a problem. Finally, if we’re getting good cost per inquiry/call, but low admissions, we know that the center’s admissions team needs additional training. Knowing your data is absolutely essential for troubleshooting campaigns and finding out what’s broken. For example, a center’s call team might complain that the inquiries aren’t strong enough. But if your admissions team is only converting multimedia inquiries at .05%, while other clients are converting at 6%, I know it’s a call team problem and not a marketing campaign problem. In that situation, we’ll set up a series of call trainings for your team. There also needs to be an understanding of progression. In the beginning of any marketing campaign, inquiries will be lower quality. Only people looking for free or low cost services are going to give you a call off of just seeing 2 or 3 ads. Those that are more serious, and that have the money or better insurance policies, tend to be much more discerning. It takes a lot longer to build their trust, so they don’t start calling in until the campaign is well under way, with the strongest inquiries coming in on much longer timelines. To get this to work, you have to go through every step and get every piece working. It’s complex to set up, and a lot to manage, but once you get the machine turning, it’s incredibly effective. Install your pixel and tracking. Built out your audience personas based on recent admissions data. Split test content like crazy to determine winners. Create excellent content to drive social proof. Use content to identify your audience and drive low cost traffic (which will turn into low cost inquiries and admits). Constantly monitor and refresh campaigns to stay relevant and engaging. Troubleshoot as needed using your data for each stage of the funnel. On top of all this, you then need to integrate your ads with Google Analytics, your CRM, your email automation sequences, and your SMS campaigns. But that’s a post for another day.